(i) Palaeolithic Age (Old Stone Age)--Palaeolithic Age spanned roughly from 500,000 B. c. to 10,000 BC. in India Palaeolithic remains have been found near upper Indus, upper Nannada region and Chennai. During this period, man lived in caves. People were the hunter and food gatherer. (ii) Mesolithic Age (Middle Stone Age)--Mesolithic Age spanned from 10,000 BC. to 8,000 BC. People had bows and arrows to hunt prey. The people started agriculture and they shifted towards river side. (iii) Neolithic Age (New Stone Age)--Neolithic Age extends from 8,000 BC. to 4,000 BC. In this age quartzite the chief material of the old stone age was replaced by trap rock or basalt. (iv) Chalcolithic Age (Copper Age)-Chalcolithic Age extends from: 4,000 B. C. to 2,000 BC. During this age copper metal was discovered. Chalcolithic remains have been found in the Chotanagpur plateau and the Gangetic basin. Stone Age ended during 2000 B. C.
1. What does the term ‘Nomads’ mean ? Ans. People who wander from place to place in search of food and livelihood are called nomads. 2. What are microliths ? Ans: Small triangular pieces of stone are called microliths used on spears and arrows during the Mesolithic age. 3. What are megaliths ? Ans. Huge, rectangular blocks of stone are called megaliths which were used to mark a burial place during Neolithic age. 4. During which age the flake implements are found ? 5. What was the first animal to be tamed ? Ans. The first animal to be tamed was dog. 6. In which region of India microliths have been found ? Ans. The microliths have been found in Brahmagiri. 7. During which age the age of metal started ? Ans. During the age of Chalcolithic the age of metal are started. 8. In which age the fire was discovered ? Ans. 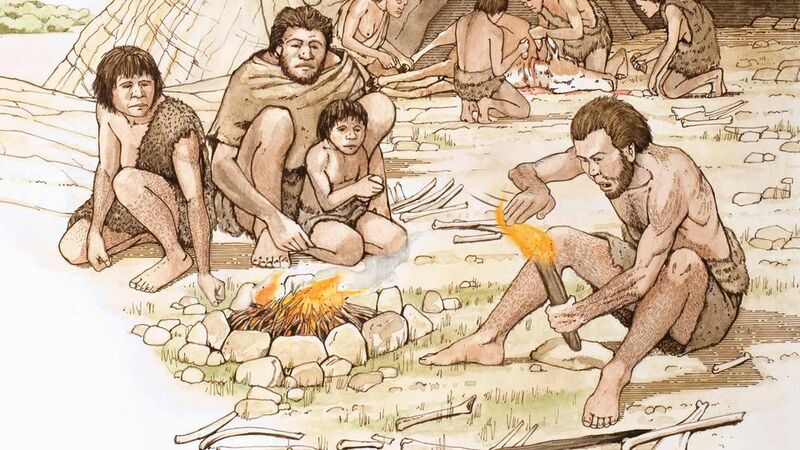 The fire was discovered in‘the age of Palaeolithic. 9. In which age the wheel was discovered ? Ans. The wheel was discovered in the age of Neolithic. Ans. About 40,000 years ago. 11. What was the most important invention of the early man ? 12. Which metal was invented first ? Ans. Copper. 13. Which metal was invented after the invention of copper? 14. Which metal was used for the ornaments during Chalcolithic age by women? 15. What was main occupation of the people in the age of metal ? 16. In which age the art of cloth-weaving was started ? 17. In which age the tools of crops-cutting were made ? 18. What are the ancient languages of India ? Ans. Pali, Sanskrit and Prakrit. 19. In which languages the ancient histow of the world are written ? 20. In which languages the books of ancient Europe were written ? Next Topic (Important) : INDUS Valley CIVILIZATION (Short Summary with 50 MCQs). Please like/Follow our Facebook Page to get Latest updates.